Offers superior abrasion and impact resistance, high weight capacity and long service life. Excellent resistance to oil, grease, salt and most acids, chemicals and cleaning solutions. Hard tread rolls exceptionally easy. Zerk fitting in Axle - Not shown in photo. 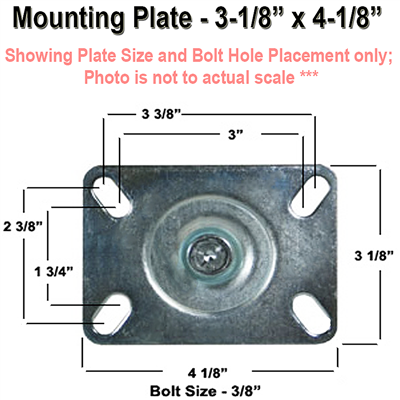 Hole Spacing Range - 1 3/4" to 2 3/8" x 3" to 3 3/8"
4" OVEN RACK CASTER - 450°F - 350 LBS CAP - [HI-TEMP] 8" X 2" High Temperature Phenolic Wheel | Swivel Caster Set of 4 | 2 With Brakes | 3,600 lbs Capacity Per Set of 4 6" X 2" High Temperature Phenolic Wheel | 2 Swivel & 2 Rigid | 3,600 lbs Capacity Per Set of 4 Heavy Duty Pan Dolly Caster - 500 LBS CAP - 3" x 1-3/4"
BAKERY & HI-TEMP CASTERS > OVEN RACK CASTERS | 3" thru 5" Wheels - Plate Size 3-1/8" x 4-1/8"
BAKERY & HI-TEMP CASTERS > OVEN RACK CASTERS | 3" thru 5" Wheels - Plate Size 3-1/8" x 4-1/8" > [MOST POPULAR] - 4" Hi-Temp Wheel - PLATE MOUNT - Good for 450° F.